Phorale Pho & Sandwiches — JDC Johnson Design Co.
Its been a great experience designing for Phorale Pho and Sandwiches located in the South Park Area. Thanks to Young Cho and Jimmy Bui for the opportunity to design for a business that is passionate about there craft. 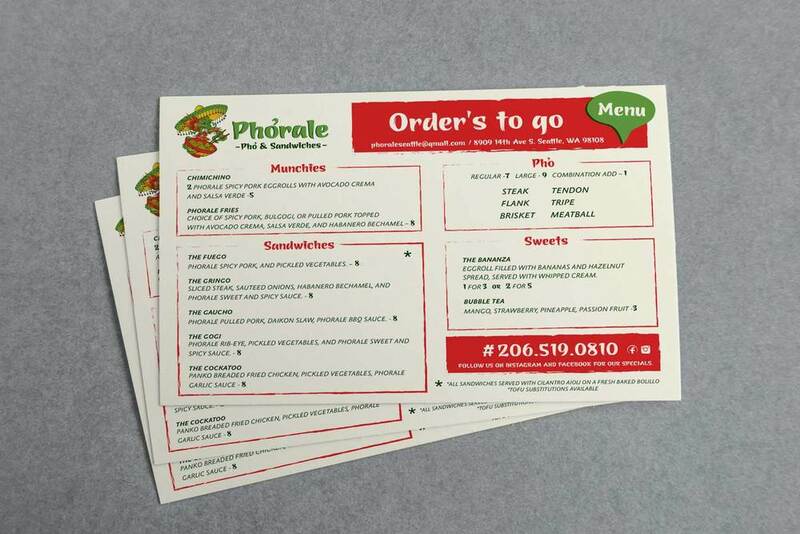 The designs commissioned consisted of Illustrating and coloring the Phorale dragon along with designing the Phorale logo, business card and menu. The original dragon sketch was produced by Timothy Sam a very talented tattoo artist in the Seattle Area. Recently Phorale made Zagats 9 superheroes of the Seattle Dining Scene. After sampling the Fuego sandwich, Its not a surprise that they are being rewarded for there unique Korean-fusion food. If you cant make it down to the restaurant location, take advantage of the take out and delivery service. Stay connected with facebook and instagram.